A burglar who killed an elderly man in a "horrific attack" in his home has been found guilty of murder. Arthur Gumbley, 87, had his hand "skinned", ribs broken and was punched in the face in Little Aston, Lichfield, on the border with Sutton Coldfield, a court heard. He died from his injuries three weeks after the attack on 21 November 2017. 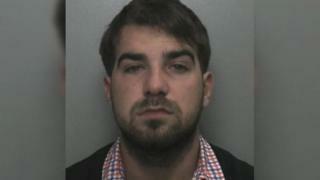 Jason Wilsher, 20, from Leicestershire, was convicted by a jury at Stafford Crown Court. Police described the attack as "horrific and unnecessary". The court heard Wilsher and another intruder raided the home in Endwood Drive, Little Aston, and stole a watch and jewellery. Mr Gumbley was punched, kicked and had the skin torn from his hand as a watch was pulled from his wrist, jurors were told. Prosecutor Jacob Hallam QC, previously told the court, the victim had approached the intruders in a "friendly way" to ask what they wanted before he was met with "immediate violence". Mr Gumbley died from his injuries on 12 December 2017. Wilsher's DNA was later found on a cupboard drawer at the pensioner's ransacked bungalow, detectives said. Image caption Det Ch Insp Dan Ison called the attack "horrific"
Det Ch Insp Dan Ison, of Staffordshire Police, said: "The attack on Arthur Gumbley was horrific, unnecessary and a blatant targeting of a vulnerable elderly man in his own home." The investigation will continue into other men allegedly involved in the attack, he added. Wilsher, of Barlestone Road, Bagworth, was also found guilty of conspiracy to rob after another elderly man, living in the Creswell area of Derbyshire, suffered injuries at the hands of burglars, also in November 2017. Wilsher will be sentenced on Friday.